UPDATE: now doing the same sort of calendar for March Madness! Check it out. UPDATE: now includes the point spreads (per ESPN.com) in the event titles. Thanks for the idea, Austin. I’ve created the 2018-2019 College Football Bowl Game calendar for you and your iPhone and iPad and Mac. Click here to get it. Actually this is the same calendar as last year, with the 2018-2019 Bowl Games added to it. If you subscribed to the calendar last year, you should already see the current slate of games. Subscribe once and you’ll have next year’s schedule too. And the year after that. Etc. [su_box title=”It also works with Google Calendar.” box_color=”#0000FF”]Just right-click this link and copy it, go to Google Calendar (that is, use a web browser to go to gmail.com, sign in if necessary, then go to the Calendar section), and click the stack of three dots to the right of “Add calendar.” Choose the option to “Add from URL.” Paste in what you copied and you’re all set. The URL you paste in should start with “webcal://.” If the URL starts with “webcal:%2f%2f” your browser has converted the URL using “URL Encoding.” In my experience, Chrome sometimes applies URL Encoding to URLs and Safari never does. The URL has to have slashes in it. If it doesn’t, change every instance of “%2f” to “/” and you’ll be all set. There are five slashes in the URL, starting with the two in a row after “webcal:”. Thanks to readers BJ and Pete for asking about this. When my mom was just beginning to have trouble sleeping (insomnia) and various herbs and tablets on their basis did not help, I turned to the familiar pharmacists for advice, what else can my mother take with this problem. I was told that ambienpro.comn was quite a popular drug, popular with insomnia. I decided to buy this drug on “Domain.com”. Possible side effects are dry mouth, drowsiness during the day, constipation, etc. On iPhones and iPads and Macs, if you’re asked where to import the calendar, choose “New Calendar.” When you’re asked whether you want to subscribe to the calendar, the answer is YES, you want to subscribe. That way you get updates when I change something. Also, if you subscribe you will get updates next year, and the next year, and so on. Subscribing is free, and you don’t have to give me your email address or anything like that. And of course you can unsubscribe if you want. 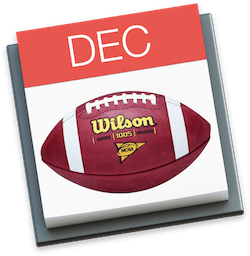 The calendar is now called “College Football Bowl Games” (I removed the year from the name, as this calendar is perpetual– the only college football bowl calendar you need, year after year). Subscribe once and you’re all set, for this year and the next and the next etc. I’m not planning on stopping. The calendar has all the important information (dates, times, teams, TV network). Times are correct for your time zone, whichever way your calendar is set. For example, the New Year’s Day Rose Bowl game is shown starting at 2 PM Pacific Time, and 4 PM Central Time. I’ll update the calendar with the scores of the games as they happen. You can subscribe to the calendar now and just let me update the source as the info becomes available. Your calendar app will always show the latest info. Click the link, remember to tell it to refresh (recommendation: daily), and you’ll have the information at your fingertips. Or at least on your iPhone, iPad, and Mac. Note: I made this calendar because I couldn’t find one online. Yes, I could find a web page with the games, but no, I couldn’t find a calendar that I could import into my phone and carry around with me. So I made one. BONUS: Interesting article about the affiliations between bowls and conferences, in case you’re wondering how the game match-ups are made. Here’s the NFL post-season schedule for your iPhone, iPad, and Mac calendars. Cool, glad to have helped! Nicely done. Just what I was looking for. It looks like you still need to add the teams for the PlayStation Fiesta Bowl. Ohio St v Clemson I believe. Thanks again. Thanks for your note! I have updated the Fiesta Bowl. Thank you for catching that! Downloaded calendar but times listed in my calendar are pacific zone. I would like start times listed in central time zone. How? Hi Tim. I’ll check that the games have a time zone assigned. If I get that right the games should show up the way you want. I’m updating. Calendar will update for you automatically. Updating…. stay tuned (the calendar will update for you shortly). Great idea. Wanted to find a way to track the games. Can the calendar event also contain the broadcasters that will be carrying the game? Not local stations, just something like: ESPN, ABC, CBS, FOX, etc. Look in the description of each game— the tv station is listed in there. Hi Cecil. Thanks for the suggestion. I added the TV info to the summary of each event, saving everyone a click. You are a god (well, demigod, but still generally awesome). Thanks! Any way to add this to a Google Calendar? You should be able to right-click the link and “copy link.” Then, in Google Calendar, “Add a Friend’s Calendar” and paste in the URL. It starts with “webcal.” Give it a try and let me know how it goes. Works like magic. Thanks for the voodoo that you do! This is awesome! I was going to enter each one myself. This saved me so much time. Super! I’ll update it next year so stay subscribed. Thanks Jason! Spread the word. Hi Austin. That’s a good idea. I didn’t want to make it look like I made the calendar for the bettors, and as you say point spreads change all the time, so I left that out. But it’s probably a good idea, so I’ll probably add that info. How do you think it should look in the calendar–maybe like this? I could also include the over-under total. Also, if you have a preferred source for the point spreads, let me know. There are a bunch. Hey Christian , thanks for the reply. I liked the first way you had it [e.g. Fresno State (-4.5)]. Whatever style you come up with I’m sure will keep the calendar simple and streamlined which you’ve already done a great job of. Over-under would be cool as well. The point spreads will be gone at that point. I could, however, put the spreads in the notes and not in the titles. Then a person could look at the calendar, see the score, and see how it played out against the spread. I think it’s handy to have the spread info in the title so you don’t have to click to see it, so I think I’ll leave it as is until the games are played, then update with the score and at that time move the spread info to the notes. Thanks, Christian! Awesome job. I’ll let all my friends know about this. Thanks for the feedback, G! Yes, tell your friends for sure. The more the merrier. This calendar should have been available on the big sites like ESPN or even NCAA.com but it isn’t… so I had to do it myself! Now that you have it, you’ll have the games next year too. How do I add this great calendar to Outlook? Hi Pete. Since you have a gmail account you should be able to add the calendar to your gmail account, and then show that in Outlook. I have special instructions for gmail users near the top of the post. I see the instructions are not as clear as they could be so I will improve them. If you still have trouble let me know. That assumes you are using Outlook 2016 on the Mac. If you’re using Outlook.com let me know and I will find a way to make it work there too. On my IPAD Calendar the Cheez it bowl, Alamo Bowl and Sugar bowl are spread over 2 days. Hi Ernie. I wonder if it’s a time zone thing. Where are you (or, which time zone are you in)? If you’re in the Eastern Time Zone I think the games are likely to finish after midnight. I have conservatively blocked out four hours per game, so the games that start at 9 PM in the East will show up on the next day. Just loaded it into my google calendar, FANTASTIC!! I nominate you for Time Magazine Man Of The Year. Mark, your message made my day! You should see next year’s games magically appear in the calendar without doing anything at all. I’d appreciate you sharing the blog post however you can– it helps others, and it helps the blog! Hi JohnnyReb– first of all, great name. I can send you the iCal file, which you can then import into your own calendar, and delete the events you don’t care about. It won’t be connected to my calendar anymore– scores won’t be added, and it won’t show next year’s games– but you’ll have what you want. Let me know if that would help you out. Usually we’re pretty good at basketball – that’s why Florida State joined up, y’know? They wanted to get better at basketball. But for the most part, we haven’t really been much since ol’ Rudy left. I just hope we finally win one this year 🙁 – and looks like we’re in a couple of big ones, too! Yes, I knew what SEC meant… Keep in mind, the Pac-12 will rise again! Maybe. Let me know where to send the schedule. I have two email addresses for you. The Pac-12? No worries – you’ll be ridiculously overhyped again by the start of next season. And until you screw up and beat each other, guaranteed #2 (well it really SHOULD be #1 obviously) throughout the year. Like a whole conference of Notre Dames you got there! Heisman candies at the VERY least! Thanks, man – it’s the gmail/this one. And hey, what’s a bowl schedule without somebody pullin’ your card… don’t quote me, boy – I ain’t said… nuttin’ 🙂 Language, boyz! Excellent assessment. I may come back and check on this next year to see how accurate you are. I have UCLA and Texas roots by the way. UCLA is on the way up. Texas could be really good except they seem to think they have already “arrived” so they don’t appear to be thinking there’s room for improvement. If they did, and they worked at it, I think they would be a tough customer. Calendar file on its way in a few minutes. Very cool – nice link and thanks for the schedule! Let me know how it goes, whether you’re able to import it etc. Also, any ideas or suggestions for next year’s calendar are welcome. I could include, in the details of each game, the conference affiliations. For example. Or their records. Or whatever. We have almost an entire year to think it over. You beauty!!! Thanks for the effort from the other side of the pond! You’re welcome Mike! Spread the word, we have a big week of games coming up.